Since its first origins some million years ago, mankind is in constant movement: Dividing itself in different entities during its migration, and practicing both violent and peaceful ways, when different tribes, ethnic groups, societies or countries came in contact with one another. Each of these entities developed its own culture, but most of the time defining itself in a positive or negative manner in relation to other cultures: adopting foreign customs, concepts and techniques (or being forced to do so), respectively demarcating itself from the other cultures - and often using both of these ways at the same time. In the age of globalization however, mankind has reached a new level of intercultural relationships. Societies become more and more multicultural because of economic reasons, but also due to enormous refugee streams as a result of wars, exploitation, social misery as well as of political and ideological oppression. That is why the ways of dealing with the - multicausal - migration flows is one of the most important question of our time: The answer to it is called integration, which has nothing to do neither with assimilation which forces the ‘foreigner’ to deny his own cultural identity, nor with marginalization and disregard, making for so called ‘parallel societies’. But of course integration requires also big efforts of the immigrants. So at least three kinds of participants are required if integration shall succeed: Open-minded persons of the incorporating milieu (also offering acceptable living conditions), readiness of the incomer to integrate in the new environment respecting its basic social consensus, and institutions (rules and organisations) moderating the integration process, providing support to both sides. So not only the incomer is asked to change in some way, but the receptive societies as well. And the effect - cultural enrichment and development - will benefit all its members, the previous and the new ones. For the International Multimedia-School Magazine “trait d’union” the themes of strangeness, migration and integration have always been central. The first issue n° 1/2001 “We are all strangers”, especially the first chapter “De otro lugar” (“From somewhere else”), consecrates entirely to them. The issue n° 8/2011 “Do You Understand Me?” (presently under revision) contains a chapter entitled Immigration and Integration. Lothar Thiel, Neu an der Deutschen Schule Toulouse (2001) Evaluation of an unrepresentative, but nevertheless insightful survey with nine new arrivals at the German School in Toulouse. Lothar Thiel, Dyskulturie - Kinder und Jugendliche zwischen den Kulturen: Anregungen zur Situationsanalyse an den Deutschen Auslandsschulen (Toulouse 2002). An e-mail to the Coordinator of the regional professional development (“ReFo”), Mr. Torsten Steininger, “ReFoZentrum” 12 at the German School in Paris/France, (2001-2004) on occasion of the upcoming ReFo „Children and young people between the cultures – chances and problems for the German Schools abroad“ in June 2002 at the International German School in Brussels/Belgium (shortened). During the “trait d’union” editors’ meeting in Rome (2009) Italian and Spanish students (from Bilbao) conducted interviews with immigrants in Rome. The video was created by Gonzalo Quincoces (German School in Bilbao). Picture 1: Two immigrants, Luz Karime Vargas from Cali/Colombia and Assane Dieng from Sedhiou/Senegal, were interviewed by the “trait d’union” editors Ander Portillo and Gonzalo Rodríguez (2011), German School in Bilbao/Spain. Picture 2: “I have a dream” by Julia Huber (Michaeli-Gymnasium München, LK 13 Kunst). In: “trait d’union” n° 5/2005 “Dreams and Developments”, p. 38. 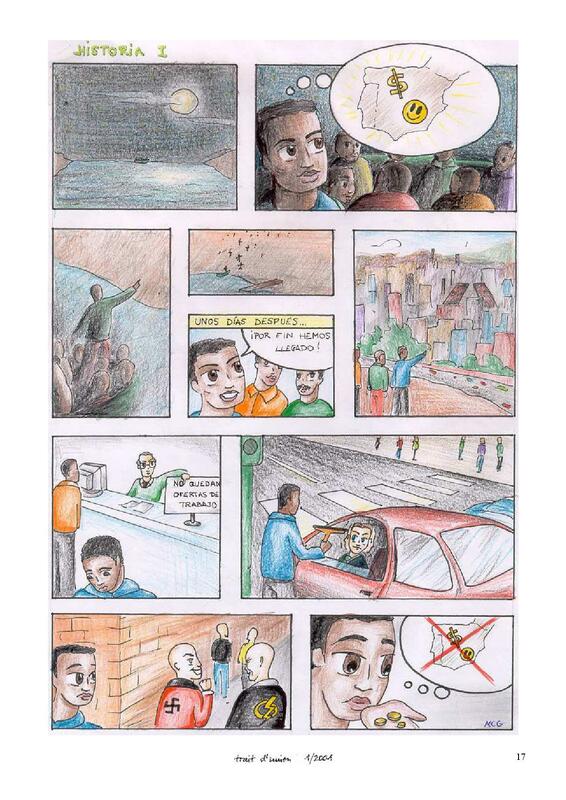 Picture 3: The comic “Historia I y II” was created by María Canales Gómez, Instituto (I.E.S.) “Profesor Hernández Pacheco”, 3°F, Caceres/Spain. In: “trait d’union” n° 1/2001 “We are all Strangers”, p. 17-18.